Send tender sentiments near or far with Barrett, a cuddly plush honey bear from Gunds®. 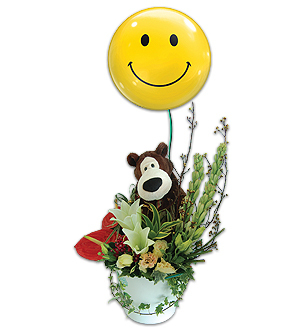 Measuring 78cm, Barrett comes presented in a bucket of Madonnas, Tuberoses, Anthuriums and a 22" Bubble® Smiley Balloon. Bubble® Balloons are a whole new category of floats. They inflate round and feature see-through material with smooth beach ball like seams that cream an amazing 3D effect. And they are so much bigger at 22”. Only at Giftlab.